Nitrate poisoning can occur commonly in cattle raised in North Dakota and other areas of the western Great Plains. Poisoning is usually associated with animals ingesting forage or feed witha high nitrate content. Sheep and cattle are more susceptible to poisoning than nonruminant species because microbes in their digestive tract favor the conversion of nitrate to nitrite. Nitrate in itself is not toxic to animals, but at elevated levels it causes a disease called nitrate poisoning. Nitrates normally found in forages are converted bythe digestion process to nitrite, and in turn the nitrite is converted to ammonia. The ammonia then is converted to protein by bacteria in the rumen. If cattle rapidly ingest large quantities of plants that contain high levels of nitrate,nitrite will accumulate in the rumen. 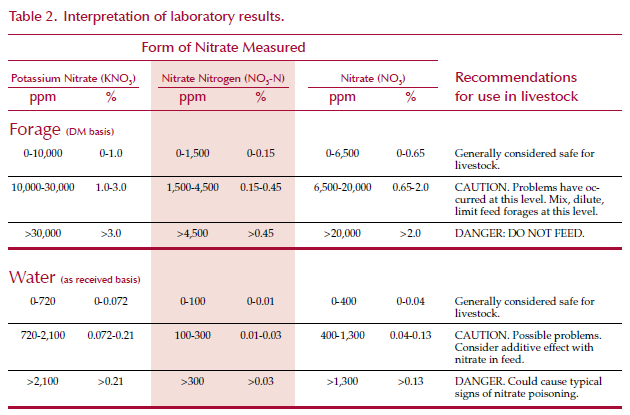 Nitrite is 10 times (10 X) as toxic to cattle as nitrate. Nitrite is absorbed into red blood cells and combines with hemoglobin (oxygen-carrying molecule) to form methemoglobin. Methemoglobin cannot transport oxygen as efficiently as hemoglobin, so the animal’s heart rate and respiration increase, the blood and tissues of the animal take on a blue to chocolate brown tinge, muscle tremors can develop, staggering occurs and the animal eventually suffocates. The majority of nitrate poisoning cases in North Dakota occur with drought-stressed oats, corn and barley. However, a number of other plants also can accumulate nitrate, including sudangrass, sorghum-sudan hybrids and pearl millet. 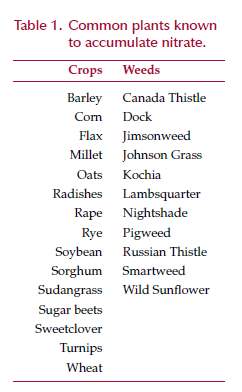 Table 1 lists common plants known to accumulate nitrate if conditions are favorable. Plants that have been fertilized have higher nitrate levels than nonfertilized plants. The abnormal accumulation of nitrate in plants is influenced by various factors, such as moisture conditions, soil conditions and type of plant. Plant stresses, such as drought, are associated with increased levels of nitrate in plants. Soils high in nitrogen readily supply nitrate to plants. Acidity, sulfur or phosphorus deficiencies; low molybdenum; and low temperatures are known to increase nitrate uptake by plants. Plant parts closest to the ground (stalks) contain the highest concentrations of nitrates. Leaves contain less than stalks or stems, and the seed (grain) and flower usually contain little or no nitrate. Most of the plant nitrate is in the bottom third of the stalk. Research from Oklahoma has shown that the lower 6 inches of the stem in pearl millet contains three times more nitrate than the top part of the plant. While difficult to do with drought-stressed forages, raising the cutter bar above 6 inches can reduce nitrate content of forages harvested as hay or silage. Nitrate decreases as plants mature. Young plants have higher nitrate concentrations than mature plants. However, mature plants still can have excessive nitrate concentrations if environmental and soil conditions are favorable. Not all drought conditions cause high nitrate levels in plants. Some moisture must be present in the soil for the plant to absorb and accumulate nitrate. If the major supply of nitrates for the plant is in the dry surface soil, very little nitrate will be absorbed by the roots. In plants that survive drought conditions, nitrates are often high for several days following the first rain (as the plant regrows following drought). Frost, hail and low temperatures all interfere with normal plant growth and can cause nitrates to accumulate in the plant. Frost and hail may damage, reduce or destroy the leaf area of the plant. A decrease in leaf area limits the photosynthetic activity of the plant, so nitrates absorbed by the roots are not converted to plant proteins, but are accumulated in the stem or stalk instead. Most plants require temperatures above 55 F for active growth and photosynthesis. Nitrates can be absorbed quickly by plants when temperatures are low, but conversion to amino acids and protein occurs very slowly in plants during periods of cool weather. This allows nitrate to accumulate in the plant. Water may be a source of toxic levels of nitrate for livestock. Water may become contaminated by fertilizer, animal wastes or decaying organic matter. Shallow wells with poor casings are susceptible to contamination. Marginally toxic levels of nitrate in water and feed together may cause nitrate toxicity in animals. Remember to consider both sources of nitrate. Acute nitrate poisoning may occur if livestock consume nitrate fertilizer. Avoid grazing immediately after spreading fertilizer. Areas where the fertilizer spreader turns or areas where filling (and consequently spilling) take place may have excessive quantities of nitrate freely available to animals. Pregnant females that survive nitrate poisoning may abort due to lack of oxygen to the fetus. Abortions generally occur approximately 10 to 14 days following exposure to nitrates. Diagnosis of nitrate intoxication is based on observed clinical signs and the possibility of exposure to toxic plants or water. A veterinarian should be consulted for a definitive diagnosis. Laboratory analysis can be performed on suspected plants, water, stomach contents, blood, urine and aqueous humor of the eye of dead cattle to confirm the diagnosis. Postmortem specimens of rumen contents are of little value for nitrate determination because most nitrate in the rumen is reduced by anaerobic fermentation to ammonia. Samples from fresh grass or dry forages need to be representative of the field or bales in question. These samples should be packaged in a clean plastic bag and shipped to the laboratory for analysis. Water samples must be collected in a sterile bottle. When collecting from a water system, let the water flow for a couple of minutes before collecting the sample. Results of chemical analysis are interpreted according to guidelines in Table 2. These guidelines apply to livestock only. Animals can be treated by intravenous injections of methylene blue. Commercial preparations intended for treatment of prussic acid poisoning only should not be used to treat nitrate poisoning. Methylene blue is not approved by the Food and Drug Administration for use in food-producing animals. You must consult your veterinarian before using this treatment. Prevention of nitrate poisoning is best achieved by controlling type and quantity of forage offered to livestock. Avoid forages with potentially toxic levels of nitrate or at least dilute them with feeds low in nitrate. When in doubt, have feeds and forages analyzed for nitrate before grazing or feeding them. Forages with sublethal nitrate levels can be fed to livestock with appropriate precautions. No single level of nitrate is toxic under all conditions. When grazing, feed a dry roughage first to reduce the amount of affected plants ingested by hungry animals. Harvested forages that are high in nitrate often can be fed safely by mixing with other feeds to reduce the total dietary intake of nitrate. Contact your veterinarian or Extension personnel if you need assistance in determining the correct ratios of high- and low-nitrate forages to blend to develop a ration for a particular class of livestock. • Drought-stressed small-grain forages and other forages suspected of being high in nitrates should be tested before feeding. • Dilute high-nitrate forages with other forages or feedstuffs that are low in nitrates. This can bring the nitrate level of the diet down low enough to where it is safe to feed. • Frequent intake of small amounts of high-nitrate feed helps adjust livestock to high-nitrate feeds and increases the total amount of nitrate that can be consumed daily by livestock without adverse effects. • Allow cattle time to adapt to increased nitrate in the diet. If nitrate levels are not excessively high (9,000 parts per million nitrate, or NO3), the animals can adapt to increasing amounts in the feed. • Allow livestock access to fresh, nitrate-free water at all times. • Be sure you don’t overstock pastures when grazing high-nitrate forages. Overstocking increases the amount of high-nitrate plant parts (stems and stalks) that are consumed by livestock. • Do not strip graze high-nitrate forages. Strip grazing also increases the amount of stem and stalk material consumed by livestock. • Do not allow hungry cattle access to high-nitrate forages or pastures. Feed cattle hays or forages low in nitrates before turning them onto high-nitrate pastures. • Supplement cattle grazing high-nitrate forages with other low-nitrate feedstuffs, such as low-nitrate forages, feed grains or byproducts. • If possible, graze cattle on high-nitrate pastures during the day and remove them at night for the first week of grazing. This reduces the amount of high-nitrate forage consumed and helps acclimate cattle to the high nitrate levels. • If possible, don’t graze high-nitrate pastures until one week after a killing frost. • Observe cattle frequently when you turn into a suspected field or pasture to detect any signs of toxicity. • Cattle in poor health and condition, especially cattle suffering from respiratory disease, are more susceptible to nitrate poisoning. • Consider harvesting and feeding high-nitrate forages as silages. Nitrate levels are reduced by the fermentation process that occurs when feeds are ensiled. • Do not allow cattle access to areas where fertilizers are stored. • Do not feed green chop that has heated after cutting or has been held overnight. Heating favors the formation of nitrite, which is more toxic than nitrate. If you have questions concerning submitting samples to a laboratory for analysis, you can contact the North Dakota State University Veterinary Diagnostic Laboratory at (701) 231-8307.